Silverlight charts have come into their own the Silverlight platform has matured and enabled powerful new charting implementations such as the Silverlight Navigator for asp.net. Now you can implement best of bread interactive Silverlight charts including financial and stock charts without any development experience with Silverlight required. 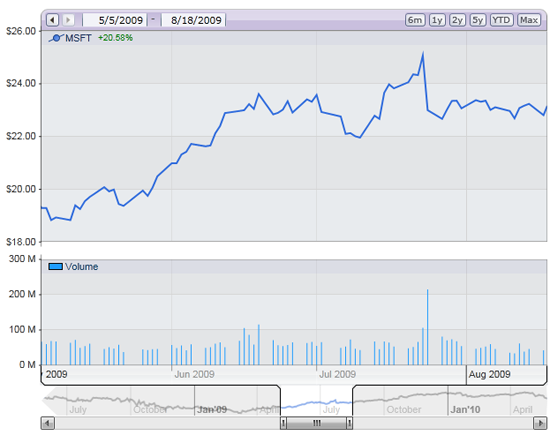 In addition to advanced interactive stock charting which usability testing has shown to be more efficient, higher performing and more advanced than similar solutions by Yahoo Finance and Google finance, the .netCHARTING Silverlight Navigator brings this power to your own chart solutions and non-financial chart types including line charts and bar charts with advanced shading types. For the first time, developers are able to leverage a true bleeding edge user interface with their own sales, inventory and traffic data untreated to stock charts. Furthermore, the .netCHARTING DataEngine automates the retrieval and formatting of records from your own database for display by the seamlessly integrated Silverlight control. User A: Professional User (Academia), no financial domain knowledge. User B: Developer, previous experience with Yahoo Finance and Google Finance. User C: Home User, no financial domain knowledge. User D: Business User, no financial domain knowledge. 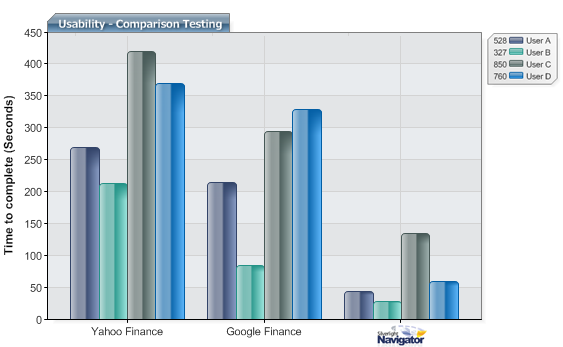 The .netCHARTING Silverlight Navigator provides a dynamic stock chart interface significantly more advanced and user friendly than Google Finance and Yahoo Finance. Advanced functionality includes real-time scaling, deep zoom, animated transitions, history with undo support, an innovative range and date selector, arbitrary selection and much more. View: Silverlight Navigator live demos.